I am learning from all the humans I encounter. Disturbing - some of it. In the 70’s I learned, started to learn, about TA. in terms of understanding behaviour and people in general. Of course I have to put my own oxygen mask on first. I need to discover more of myself to be able to in helping relationships with others. I learned about the PARENT tapes within me. Parents taped in my subconscious alongside other significant ‘parent’ type figures. How, without knowing it, model the emotional behaviour of Parents - all in the mix with my own experiences. I learned how we are living recording machines. AND most significant, alongside memories and audio visual recordings, we record feelings. These stay with us through life and stay powerful influences until we grow up emotionally. Never completely for anyone - I believe. That is why I go on about BECOMING. Becoming all that we can become - is a life journey. have been unable to love us. 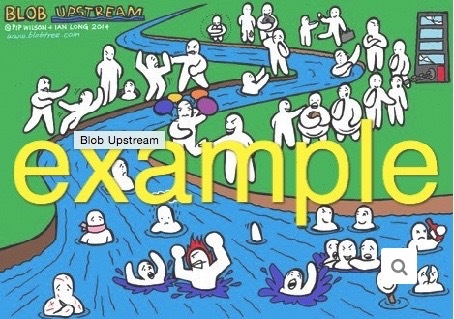 We all have a UPSTREAM. It is an act of ultimate self-disclosure - self revelation. which is a about encouraging the development of 'whole person’ communication. Building a wide repertoire of awareness and skills to help relationships and life itself. One way to develop emotionally is by sharing your inner life with others. Why not join in with others by responding to my weekly questions project called ‘Becoming Questions. You will find them on my www.pipwilson.com website. * 'Blob Level 5' is a book that helps the reader to grasp the different layers of communication that happens each time that we have a conversation. Starting with cliches and ending up with total openness. It provides a positive understanding of the need to express ourselves at a deeper level. Each section is covered using illustrations, exercises, questions and places to make notes. Towards the end, it applies these ideas in the areas of bullying and spirituality.